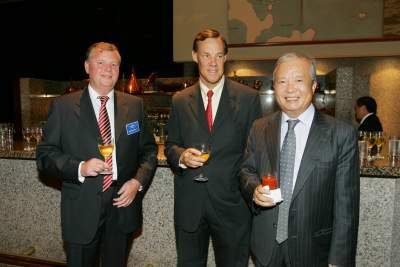 Hong Kong: Always an acute reader of the dry bulk trades William Swigart (pictured centre), a co-founder and owner of Santana Shipping, is biding his time before he makes an opportunistic acquisition or two as he looks to rebuild a fleet of handysize bulkers. Named after a type of wind from California, Santana has always been a tramp operator. Swigart and his team had built up a fleet of 10 ships before offloading all of them ahead of the 2008 crash. Ever partient, Swigart waited until August 2012 before getting back into shipowning, taking the 2005-built, 31,603 dwt log carrier Gitta Oldendorff from Japanese owners. The ship has since been renamed Anacapa Light, as all Santana ships are named after lighthouses. Like all other Santana ships in the past too, the ship flies the Hong Kong flag and is managed by Hong Kong’s Fleet Management. On when he will add to the fleet Swigart is circumspect. Hong Kong headquartered handysize operator. Sold off its fleet of ten ships ahead of the 2008 crash. Returned to shipowning in mid-2012 with a log carrier bought from Japan. Now looking at opportunistic acquisitions to build a small, niche handysize fleet.